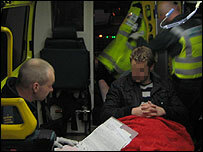 A "drunks-only" ambulance is mobilised on occasions of widespread drunkenness in central London. What's it like aboard the "Booze Bus" on one of the busiest party nights of the year? "I love the job - I like being able to make a difference. No two days are ever the same," says paramedic Brian Hayes with a jovial grin as he describes his job. Over the course of a 12-hour shift on Friday night, he and his two colleagues on the Alternative Response Vehicle - or Booze Bus, as it's more commonly known - draw on their reserves of composure, ingenuity and stoicism to treat more than 20 dazed drunks. At St Thomas' Hospital, where some of these patients are taken, a visibly-frustrated doctor speaks despairingly of dealing with a tide of alcohol-related problems, instead of people who are seriously ill.
"Everyone I've treated tonight has been drunk - this is ridiculous," he says. At about 0200GMT, he predicts things are only going to get worse as the night goes on. "I have no beds in my observation units as we're full already. This is the calm before the storm - it'll go ballistic." One drunk patient had assaulted him, he says, and the waiting room was full of people being sick or aggressive. "Twenty-four hour drinking has made a huge, huge difference. The problem is that staff are dealing with people who are drunk and don't know what they're doing," he says. "Doctors are run off their feet and in the vast majority of cases it is just alcohol. It is binge drinking. We don't see people who've had just two drinks. People have had 20 shots of vodka. "They're generally 18 to 25, but it's all sorts - including lawyers and people in their 60s." An hour later the stench inside the ambulance is thick and overpowering after three patients have been picked up. The smell of stomach bile, excrement and stale urine fills the enclosed space as the vehicle speeds through the West End streets. A scantily-clad 21-year-old woman lies motionless with one arm attached to a saline drip. She was found lying unconscious near a West End club and taken inside by a doorman. Her stockings sag limply around her ankles and she occasionally stirs to vomit into a tray, her eyes opening briefly and rolling towards the ceiling. On a seat next to her a man in his early 30s is being attended to. He was found unconscious in a corner of the same nightclub suffering from the effects of a cocktail of drink and drugs. Another seat is occupied by a 60-year-old man, found outside Holborn Tube station, whose silver hair is matted with a layer of thick, crimson blood. He is slumped, with a steady trickle of saliva dribbling down his chin. The man has soiled himself. The Booze Bus - or Vomit Comet, as it has also been dubbed - was Mr Hayes's creation three years ago. The three paramedics take the alcohol ambulance out at times of heavy drinking, such as the World Cup, Gay Pride and the festive season. On a busy night it treats more than 20 people. "The idea was to make everyone's life easier and make handling Christmas drinking more manageable," says Mr Hayes, 37. "Normal ambulances are freed up to do work that matters and can save lives. It also means there's a hospital bed free." Unlike other ambulances, it does not carry an ECG machine because it won't need to treat chest pains and the extra space can be filled by a patient. It can take up to five patients to hospital in one trip - if no-one is seriously injured - rather than sending multiple ambulances. On a Friday night in mid-December, with Christmas office parties in full flow, Leicester Square and Soho are packed with revellers, increasing the demand on London Ambulance Service by 10 to 15% compared to a normal Friday. Mark, a civil servant manager in his 40s who had been drinking since 12 noon, found himself slumped over his Chinese meal due to one such party - prompting his colleagues to tie him to a chair and carry him out of a restaurant. And there was Sally, a 24-year-old accountant, who was struck by a glass which was either dropped or thrown at her firm's festive celebration and left a shard embedded in her forehead. Meanwhile, Stephan, a Swedish special effects technician broke and dislocated his ankle after climbing over railings to get into Soho Square Gardens after drinking at least seven pints at his work party. But 18-year-old James bucked the party trend and was instead a victim of pure violence. He was found wandering around Leicester Square shirtless, with one shoe and a bloodied face after being set upon by more than a dozen youths. Throughout the night and early hours, the three crew members exchange rapid-fire banter and remain upbeat when faced with a procession of bleary-eye patients in all shapes, sizes and ages. "It's about being tolerant. Most of the people we deal with have been vomiting on themselves," explains Mr Hayes. But he adds: "It scares me that these young girls are getting into nightclubs. There is a massive problem with underage drinking. "I don't know what's happening to society as a whole. It's scary - it's not just the kids. It's also adults. People in their 40s and 50s who you would think know better. "But then you get a job where you make a massive difference, and you feel much better." The names of the patients have been changed. As a paramedic myself this article comes as no surprise to me as this has been going on for years, the only difference now is that it is now every day and no longer confined to Friday and Saturday nights and Bank Holidays. These people should be billed. I have gone on a night out and had a few too many but always found my way home, the trick is to stop when you have had enough. If these people had a bill for a couple of hundred quid land on their doorstep for 'ambulance and hospital fees' then I am sure that they would think twice before getting 'wasted' next time out. This article is absolutely tragic. It is absolutely shameful to think of these hard-working, professional people having to scrape drunks off the pavements when they should be treating those who really need their help elsewhere. It makes me so angry that I am paying National Insurance every month to support idiots who can't decide for themselves when they've had enough to drink. I find it sad that in 'office culture' going out with the express intention of getting wasted is still smiled upon, and being hungover over on Monday morning is something that is boasted about, rather than 'owned up to'. If the authorities can go to the trouble and expense of organising a dedicated service for those who cannot control themselves in a reasonable manner, then why would it be so difficult to make it a chargeable service?. Make a profit from it and use the raised revenue to support people who face all sorts of difficulties through no fault of their own. It's about time society realises that 1 in a hundred people can cause untold chaos, misery and expense to the other 99 who have respect for their fellow members of society. Personally I think that this is a really good idea, it means not putting a fully blown ambulances to deal with the drunkenness of people where they can be used to save the lives of others. Mmmm, wonder if they will bring them out in Scotland. Can someone please let me know where all of these 24-hour pubs and bars are? I haven't seen one since 24-hour drinking was introduced... And thank you to Mr Hayes and his colleagues for providing, sadly, a much needed service. Try not to drink at your office party. You'll be branded a wuss, mocked all night, and end up with your soft drinks spiked. And it's hard to say no when your boss insists you have a drink. I am getting thoroughly sick (excuse the pun) of the complete mindless carnage when going out in town on what is now most days of the week. 24-hour drinking was just an excuse to line the pockets of the alcohol manufacturers' pockets - lots of whom are very influential with political connections. I don't drink. I ideally wish people wouldn't either but if they're going to, then can't they contain them to some special areas of town and cart them off to a disused warehouse to collapse when they're spent and vomiting?